Monday night’s game was a battle against supremely contrasting styles of basketball: the San Antonio Spurs’ methodical (dare I say slow?) approach to the game versus the Sacramento Kings, the second-fastest team in the NBA in terms of pace. It should come as no surprise that the Kings ended up scoring 20 fastbreak points to the Spurs nine. What should come as a surprise, however, is that the experienced Spurs faltered down the stretch while the young Kings looked poised and took advantage of the Spurs’ mistakes. 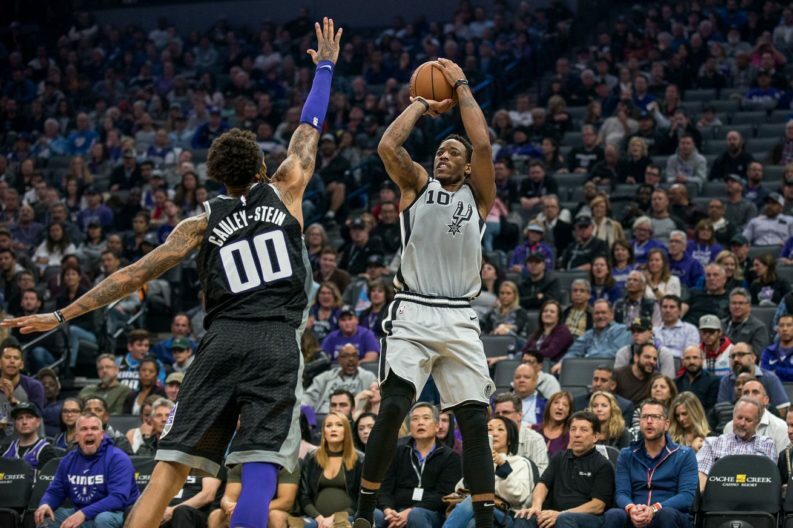 The Kings went on a 10-0 run near the end of the fourth quarter – mostly from poor shot-selection and turnovers by the Spurs – breaking a 90-90 tie and putting the game out of reach for good. This ended the Spurs’ 14-game winning streak against the Kings, and it came just five days after the Miami Heat ended their own nine-game losing streak against San Antonio. Not the kind of streaks I like to see broken. Even though the Spurs’ defensive rating has steadily been on the decline (in a good way) the past couple weeks – they came into tonight’s game 12th in the NBA after being dead last early in the season – their effort on the defensive end is still not passing the eye test. Tonight was no exception, and Pop certainly took notice. The starting line-up for the Spurs – Derrick White, Bryn Forbes, DeMar DeRozan, Dante Cunningham, and LaMarcus Aldridge – were unable to hang with their Kings counterparts. Every Sacramento starter is a threat to score, making them tough to defend, especially when the Spurs are not rostering many plus defenders. Outside of DeRozan, the starters finished the night with a double-digit negative +/-, with Aldridge finishing a team-worst -18 on the evening. Rudy Gay came on for the first time with just under four minutes remaining in the first quarter and the Spurs down five. He wasted no time in making his presence felt, hitting a confident looking three pointer from the top of the key. He also hit a jumper to end the quarter, bringing the Spurs within one point of the Kings. The second quarter was defense optional, with both teams putting up 31 points. The second-quarter heroics belonged to Cunningham. The Kings had just taken a seven-point lead before he went on a seven-point run of his own to tie the game. Cunningham will probably never lead the Spurs in scoring for a game, but so far he’s done a great job picking and choosing his spots. When all was said and done, the Spurs ended the first half down 55-56. The second half came down to the Spurs’ inability to hit a shot from the outside. After going 6-12 in the first half, the Spurs went an abysmal 4-19 in the second half, with three of those makes coming in the final minute or so of play once the game had already been decided. In addition to the Spurs missing a bunch of makeable looks from deep, Aldridge fumbled away a couple possessions down the stretch, leading to buckets on the other end. After yet another disappointing loss on the road, the Spurs drop to 7-5 on the season, with their next game being on the road against the Phoenix Suns on Wednesday. Coming into the game the Spurs’ biggest advantage was in free throws, and that trend continued tonight. It didn’t look that way early on, as the Spurs somehow managed to only shoot one free throw the entire first half, and that came off a defensive three-second violation. During halftime Pop must have told his guys to be more aggressive, as they (mainly DeRozan) appeared to be focused on getting into the lane, which led to 15 second-half free throws and some frustration boos from the home crowd. The Kings’ biggest advantage coming into the game was fastbreak points. While the 20-9 advantage for the Kings hurt the Spurs tonight, it was better than the 23-7 advantage the Kings had prior to this game. The Spurs had a slight advantage over the Kings in terms of three point percentage, but tonight the Spurs shot 32% to the Kings 46%, and the shooting percentages were especially lopsided in the second half. The Spurs and Kings have had similar bench production throughout the season, but the Kings’ bench outscored the Spurs 45-27 on the night. Rudy Gay provided 14 of those and Davis Bertans contributed nine in only seven minutes of play. Bertans took a nasty shot to the face early in the second quarter that forced him out of the game. He came back in the second half and was the only player on the Spurs who could hit a shot from the outside. Bertans still only played six minutes in the second half, which was strange considering the struggles the Spurs were having from distance. The Spurs still lead the NBA in fewest turnovers at just over 12, but for the second straight game the Spurs coughed the ball up 15 times, with a number of those coming during the clutch moments of the game. Aldridge continues to struggle in the post, adding four turnovers (two of them late) to zero assists. He looks genuinely uncomfortable with the ball in his hands right now. He did bring in 18 rebounds, but there were a lot of rebounds to be had in the second half with the Spurs throwing enough bricks to build homes in Sacramento. Bogdan Bogdanovic had an excellent game, scoring 22 points in only 24 minutes. Dave Joerger said Bogdanovic would be restricted to 20 minutes tonight since he was coming off an injury. Last I checked 24 is greater than 20, so I would protest the game if I were Pop. The Kings are on their way up, and I enjoyed watching them tonight. They have a lot of young talent and their roster is deep. I hope they can finally find some stability and work their way up towards the top of the Western Conference in the coming seasons.